Thank you so much for all the kind comments on my 80's Fantasy Film swap - so proud of Ming you wouldn't believe! I'm just relieved Fraggie liked him; sending out a swap is always nerve-wracking. 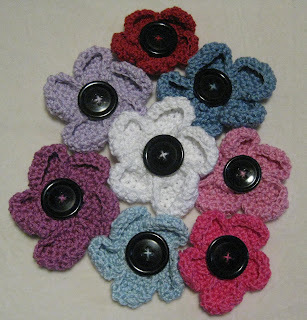 Just landed in the shop - crochet poppy brooches. My own pattern, of course, in lots of yummy, cheery colours to perk up an old coat or a bag (or perk up an old bag!). Treat yourself, or pop one in your mum/auntie/sister's stocking! Whilst we're on the subject of flowers, I finally treated myself to Kanzashi in Bloom: 20 Simple Fold-And-Sew Projects to Wear and Give , which I can pretty much review as Very Good Indeed. The instructions are quite easy to follow and it's fun and interesting to pull together something as sweet as this. Of course, I already have some experience with origami so I found it quite intuitive to fold; I'm not sure exactly how easy this is for the complete beginner but it's definitely something you should try whatever your experience. This kanzashi has been firmly claimed by K, but I'm out of hair clips at the moment so she'll have to hang on! Wow. Etsy is full of beautiful folded flowers, don't think I'll be competing just yet...but I will make these to order if anyone's interested. I love the FIMO buttons too - they are such fun to make, aren't they? Aw, thank you! I can't believe two of the brooches went straight away, thanks to a Facebook fan :D So pleased. Yes, we had lots of fun with the Fimo. No idea what I'll use the buttons for, though. 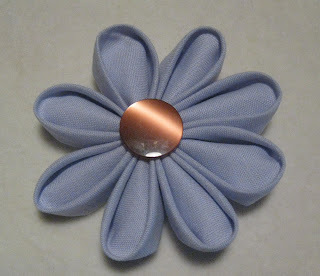 It's hard for me to tell just how difficult Kanzashi are, really - it is simply a case of half a dozen folds on a square of fabric, then threading them all together and attaching a button and a circle of fabric to the back. The instructions are very clear, even better than a lot of origami ones I've seen. The hardest part for me was getting it threaded and tied off at the right tension; I think this one is a little loose and not as robust as it should be. The real skill, I think, is in choosing the fabrics and how you put everything together. Put "kanzashi" into Etsy sometime, I nearly fell off my chair at the beauty of some of them.